Korean food is one of the big loves of my life. While Nina and I were in Thailand, she kept informing me that for her, it is Thai food that beats any other food. When she looked at menus, she wanted to try everything on them…literally, everything. She loves the smells, she loves the flavors, and how everything comes together. During our 28 hours in Seoul on our way back, I was immediately reminded that it is Korean food that does this for me. The city was full of food smells, and I was craving, craving, craving everything. 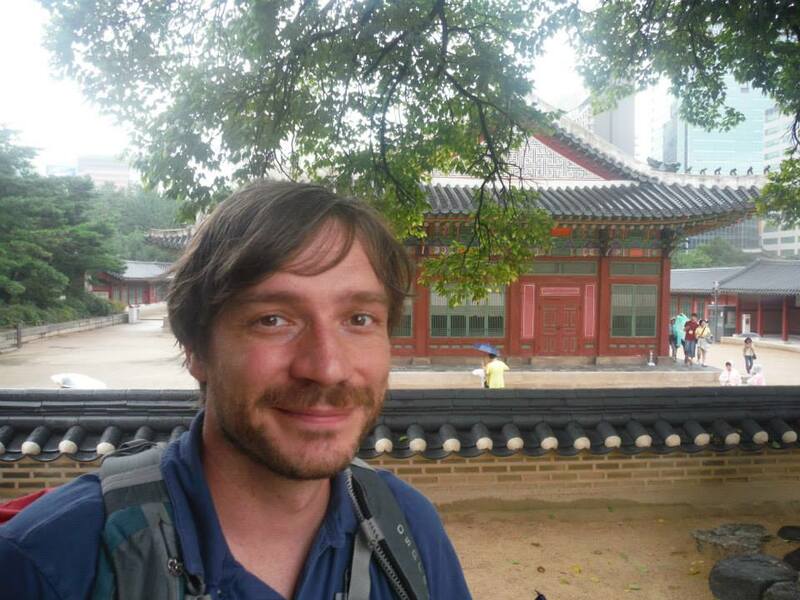 One of my favorite spots in Seoul: Doksugung, a palace opposite City Hall in the heart of Seoul. I went to Korea around this time of year 13 years ago for love, and fell in love with the country, its people, and its cuisine. There is a simplicity that is not boring, and an honesty in Korean food that I greatly appreciate. Many dishes just contain a few ingredients. The flavors are far from simple, because they are actually rather layered, but it is a modest approach (except for the insane heat in a lot of dishes). In East Asia, they have a saying that pretty much states that Japanese food is pretty, Chinese food tastes good, and Korean food fills your stomach…you get the idea. 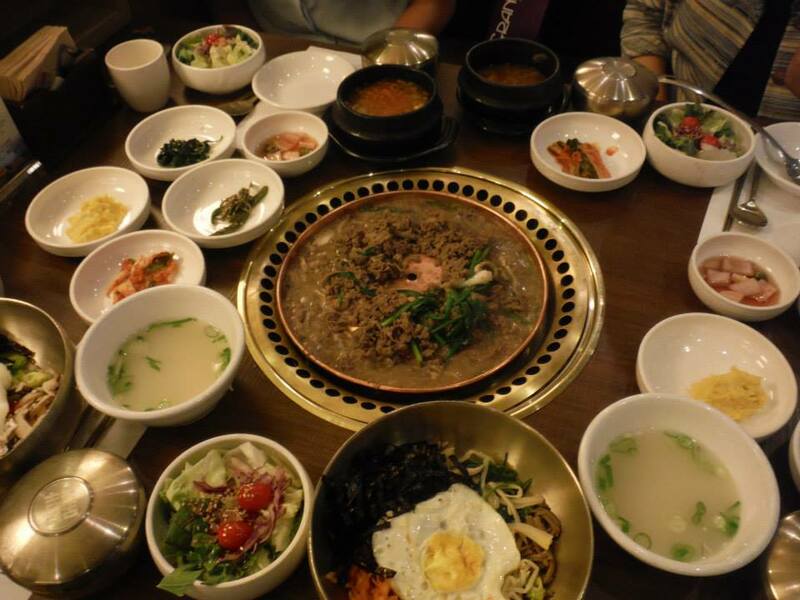 Korean meals are communicative, usually served family style with the senior party member ordering the food. I was working at a consulting firm at the time, and the great thing about that was that I got to try all sorts of food, because we would always go for lunch in a group of people, and I was always the youngest member so had no real authority over what I was going to eat. 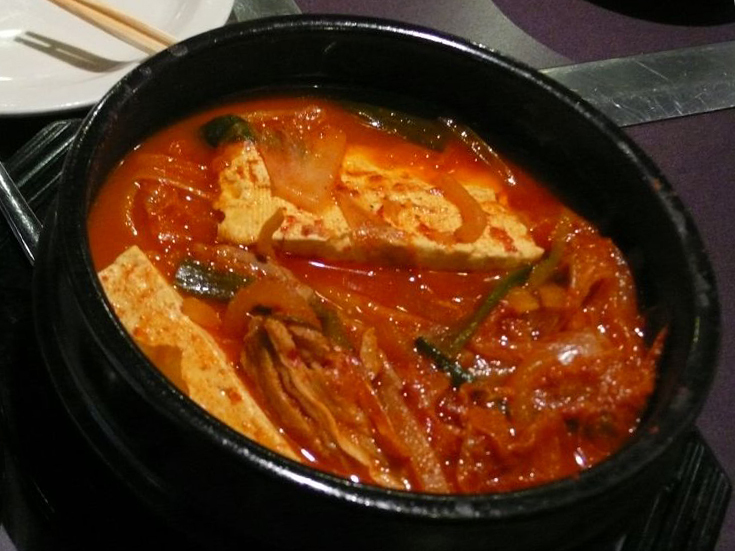 I was exposed to soups and stews, for which Korean cuisine is rather famous: from the fermented cabbage based Kimchi jjigae to the the SPAM, ramen and hot dogs containing budae jjigae (literally “Army Soup”, invented after the Korean War – I am still a big fan). We would eat all kinds of grilled meats and fish, with dipping sauces, from the famous Bulgogi (marinated beef strips that are grilled at the table) to squid and steaks on the same grill. The possibilities were endless, and I got to try a lot of them. Moving back to Germany, it was virtually impossible to get good Korean food. I actively sought out Korean restaurants in phone books, but when I went, they were usually Korean-run places that had a big generic Chinese food menu, with a half page in the back that read “Korean specialties”. It was frustrating and pathetic. I guess there never was a real market for real Korean food. Germans like to go to Chinese restaurants (which have nothing in common with actual Chinese food), but Korean? Way too exotic. No one would go because, as a German saying says: “The farmer doesn’t eat what he doesn’t know.” Whatever Korean food I was able to get in restaurants, was usually ok, but never really as mind-blowing as I was used to. There are a few exceptions in Germany, Frankfurt being one that offers decent Korean food (notably the restaurant “Shilla”). Berlin now has a trendy and hip and very delicious Korean restaurant called “Kimchi Princess”. Luckily, I had and still have my dear friends ManSoo and his wife Hyekyung in Trier, where I was living. They kept my love for Korean food burning by inviting to dinners with all my favorite foods, bulgogi, japchae (a glassnoodle salad), spring rolls, Kimbab (the Korean sushi roll) and more. These home cooked meals were highlights of my months. The coolest thing though was that since ManSoo always loved Mosel wines, he began pairing them with Korean food. That was an eye opener! These fruity Rieslings with residual sugar matched the strong and pungent flavors of fermented cabbage, fermented soy bean paste (those Koreans really like to ferment! 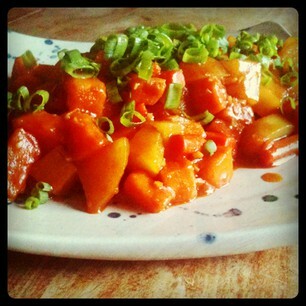 ), and the acidity cut through all the heat in some dishes. Just incredible. We would have elaborate Korean dinner parties with tons and tons of Riesling and it was just divine. Some of my best memories of my ten years in Trier are connected to these evenings and the friendship they expressed. 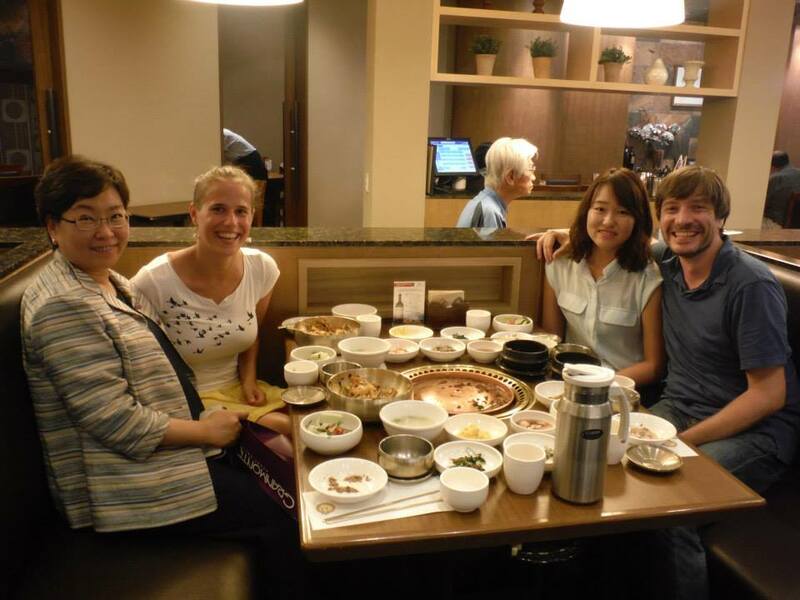 They also provided the communal aspect to Korean food, which I had missed as well. 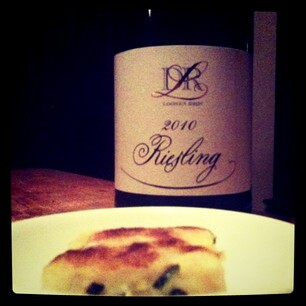 The best thing about these dinners was that we combined my love for Riesling with my love for food. Just like with friends: Being able to make your two best friends really get along well is just awesome and furthers the bond. We met for lunch with Ms. Song (and her daughter, who was 7 when I was in Korea last!) at Sariwon, a group of several restaurants that are famous for their bulgogi. After hugs and a ton of excitement of seeing each other again, our table started to fill up. And that is one of the things I always loved most about Korean food. While you do get “main courses”, the restaurants always provide between 6 and 10 different little snacks, called banchan, from steamed spinach to kimchi to little dried fish to water radish kimchi to sweet potatoes in hot sauce…the number and range of different banchan is incredible. Best of all, there is free refills on all of these. If you are done, you just tell the waitress to bring more. They are provided for free by the restaurant! (This is the biggest difference to Korean restaurants abroad, where, if you are lucky, you get 4 to 6 banchan, but they are, if at all, only grudgingly refilled.) Ms. Song had also ordered bulgogi for all of us and a soup/stew for her and her daughter and two other dishes for Nina and I….it was a grand feast! Just what I had been missing for all these years…it was wonderful. The food tasted great, the company was wonderful, and time just flew. THIS is what a table in a Korean restaurant should look like…at Sariwon. For dinner with my former boss, we went to a very fancy restaurant called Yongsusan, a group of several highly acclaimed upscale Korean restaurants (they have one branch in Los Angeles San Francisco!!). This was a completely different, yet familiar ceremony for me. This menu contained 9 courses (I believe), and we sat in a private room of the restaurant. We drank traditional Korean rice wine (called makkoli, which only has 6% ABV) and enjoyed highly sophisticated dishes of ancient Korean royal cuisine. This was much more refined than anything I had tried before. Forget the heat, forget the pungent smells and flavors. This was all refinement and focused flavors. It was divine. Finally, you might say, finally a riesling that you have tried and you can compare my notes with your impressions. I admit that I have not tried many rieslings that are easily available here in the US. I have seen the ubiquitous bottle of this wine at Trader Joe’s but was unwilling to pay the $10.99 they were asking for it. So when, on our latest Costco run, I spotted the Dr. L for $8.99 I decided to give it a try. It seems to be the go to riesling for so many people here, and there was no reason at that price point to not give it a try. First things first. I am usually not very optimistic when it comes to huge productions of quality winemakers, because all too often I have found them to be wanting. In Germany, I have not had many Dr. Loosen wines, so I also was not very comfortable assessing this and putting it into perspective. Then seeing the $10+ price tag for a very simple wine, I was even more turned off. Add in that I also tend to shy away from things everyone likes, Dr. L was in a bad position to start with. If you call all this over-thinking things, I guess you are completely right. I am glad that the price tag made me overcome all my preconceived objections. When I decided to make Korean squash pancakes (hobakjeon, 호박전) with mushrooms, I figured this was the night to try the wine. I have had many good experiences with the Korean food and riesling pairing (for example here), so it seemed like a no brainer. 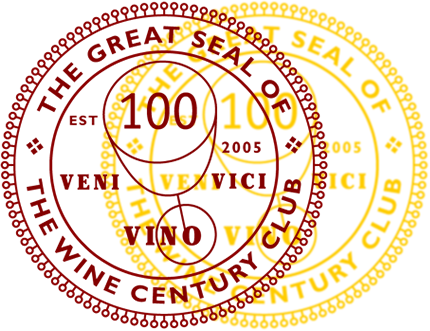 For those not familiar with the wine, just a few quick facts. Ernst (or Ernie) Loosen, the owner of Dr. Loosen Estate, is one of the major producers along the middle Mosel with vineyards in many prime sites (Wehlener Sonnenuhr, Graacher Himmelreich, Ürziger Würzgarten, Erdener Prälat, Erdener Treppchen). He is a charismatic figure and has done loads for promoting German rieslings. The Loosen Bros. Dr. L is his entry wine produced for a global market. The riesling grapes come from all over the place and are blended for this wine. The wine has 8.5% ABV. 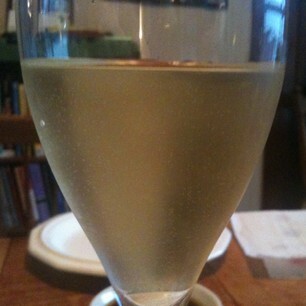 Upon opening the screw cap of the beautifully dark green bottle, we poured a light yellow wine. As soon as Nina put her nose into the glass, she sighed “Aaaah, real German riesling, I missed you”. She relished the nose of what she described as summer fruits, peach, pineapple. To me, the nose did not really open up much or impress me. I got the peach and some floral notes later, but not initially (and no, the wine had not been chilled too much). The palate, though, was very nice. Peach, apples and citrus notes dominated it, with some herbal notes in the background. It had a nicely present acidity (probably owing to the vintage, 2010 had loads of acidity; read more here) that played well with the sweetness of the wine. In my view, this acidity was what carried it through and made it interesting. It is definitely a tad on the sweeter side, but the acidity makes it quite refreshing. It went great with the pancake and its soy-sauce based dips. At nine bucks, this is a good value for a wine. We will be stocking up for sure. 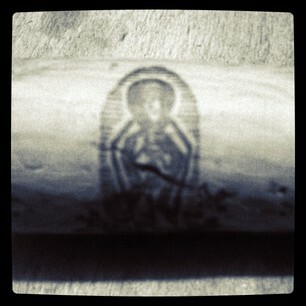 I am a little worried about the 2011, because if there is less acidity this could end up just too sweet. We’ll see. I will be drinking the 2010s as long as I can and then make the switch. It was nice to see that none of my worries came true. 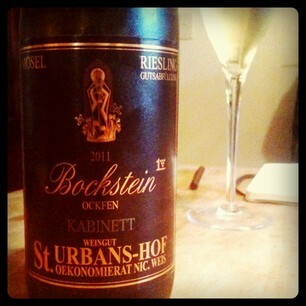 I whole-heartedly recommend this affordable, everyday German riesling.